Last Thursday, I attended a fundraiser benefiting the UNICEF Chinese Children's Initiative. The Spring Wing-Ding party was held at Shan Social House, a new Japanese restaurant/bar/lounge situated in the middle of La Cienega's restaurant row. I caught up with old friends, chatted with UNICEF staff members about its mission in China, witnessed dragons moonlighting as acrobatics all while enjoying plates of roast pork in steamed buns, beef sliders, scallops drizzled with caviar, and crab crostinis. I spoke with the UNICEF staff about the harsh living conditions that face millions of children in China. The life reality is that at least 100 million children in China live in homes that subsist on incomes of less than $2 per day which means the magnitude of the issues confronting them will require decades of concerted efforts on the part of the Chinese government in cooperation with international organization. Because China is experiencing a boom in prosperity, growth, and modernization, much of its socioeconomic woes have faded into background noise so I applaud UNICEF for casting the spotlight on this plight. I was born in China. I speak Chinese. I'm a lawyer. So I'm pledging to do more than just attend a party and blog about about it. Typically, I would wear a cocktail dress to a red carpet charity event but since the party was my first stop of the night as I was also going to my friend Sydne's birthday party at Fig & Olive, the Sandro Paris party at Chateau Marmont, and a pit stop at Yogurtland, I opted for a casual outfit that would fit in at all four places. 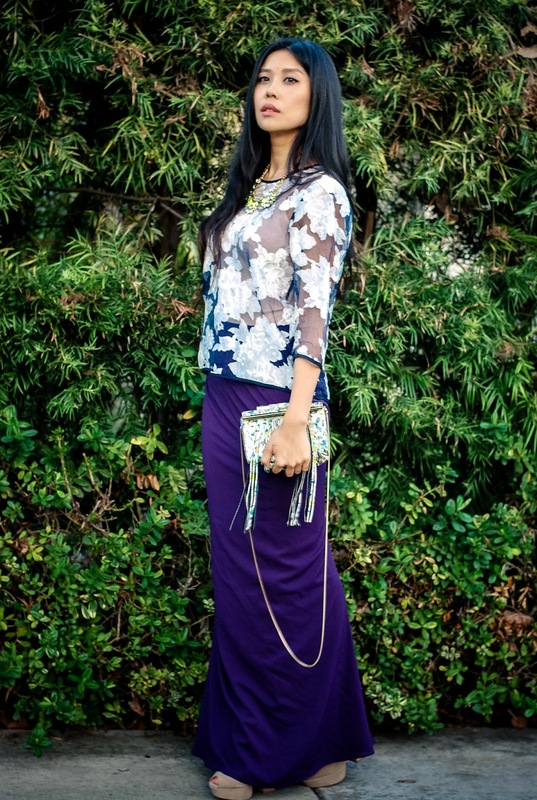 I wore a McGinn floral blouse with my Lovers + Friends mermaid maxi skirt for a ethereally romantic look that was dressy but not overdressed. The interesting print of the organza blouse was the focal point so I kept my accessories simple and complementary with a Katherine Kwei clutch and a yellow statement necklace from Nzaara. I love that you paired these pieces together. Gorgeous! This top is sooo pretty!! 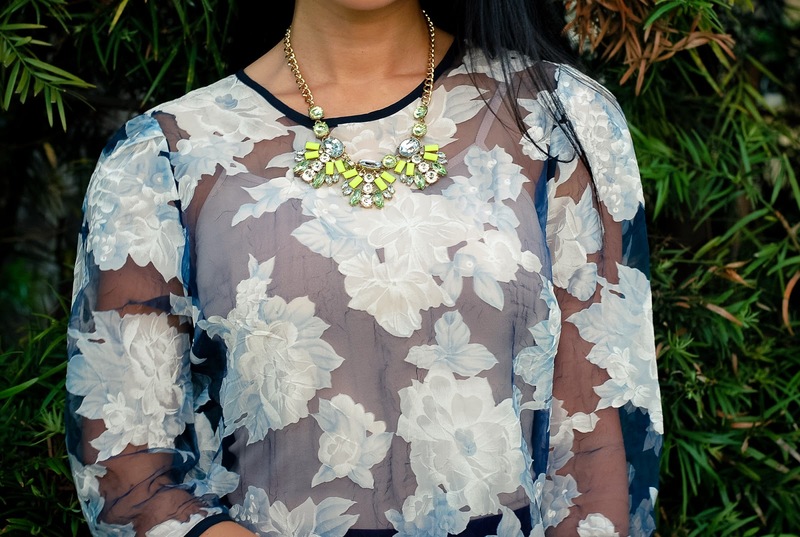 Delicate florals and sheer....could it be more feminine? LOVE it.